To get the conversation started, we’ll go through some of those posted in the comments section of the comparison itself. By the way we are considering making this type of articles a regular feature on our blog, so we’d appreciate any feedback you might have on the idea, too. Unless I’m wrong, iPhone 5 offers USB-OTG as well. Lightning cables to connect USB drives and microSD cards have been shown. Not quite. The iPhone 5 does have the camera connection kit, which lets you import images from various storages, but that’s not full-featured USB. For example, the Galaxy S III can connect to mice and keyboards. Not to mention that you can access the full file system of any memory cards and thumb drives you connect to it and not just import the images that are stored on them. How the hell it was a tie in phone and SMS!!!! GSMArena even the web browsing, when SGS3 shines you call it a tie?! Actually, it’s not – we called the telephony and web browsing chapters in favor of the Galaxy S III. But let’s not let the facts get in the way of a good argument, eh? Compromising is going nowhere. With this abstract topic, you can make the most phones come in same story. Sorry, but even Canon vs Nikon, even the best warriors, even if they’re both good, just One is the winner. In every fight there is a Winner. Choose one, you made a site, a topic, a blog, you decide. The consumer don’t understands generally like you, that’s up to his choices, he’s…”not so informed” let’s say. Of course, there’s a winner in every fight, but in this case things aren’t quite so simple. You see the iPhone 5 and the Galaxy S III are both great smartphones and each has its strengths and weaknesses (actually not weakness, really, just area where they are not the best). Which smartphone suits you best depends mostly on your usage pattern and even though we’d love nothing better than saying X is better than Y, we just can’t. You see this site is visited by about 1.5 million people daily and each of them has their unique needs and preferences, so how could we say that the iPhone 5 is better because of its build quality or the Galaxy S III is the winner just because it supports more video formats? One might decide to put a protector case on their expensive new smartphone to protect it from drops (in which case looks hardly matter) or they might not watch video on their smartphone at all (so what’s the use of a great video player?). What we decided to do instead is compare the two most popular smartphones of the season in various real-life scenarios and call which is better in each of them. You should then decide which of those matter to you and which are irrelevant and pick the best one for your personal needs. You can hate us all you want for it, but we feel that is the right thing to do. I don’t think you can award any extra points for iMessage, considering the SGS3 comes with not only ChatOn, but Google Talk, a cross platform messaging service that works through your GMail address. It’s got a wider platform base, working on all Android devices, plus any computer that can access GMail (probably iOS too, but I’ve never looked). First of all, GTalk is available on any device with a browser and that naturally includes the Apple iPhone 5 – all you have to do is go to the GMail website and login to your account. But that’s not really the point here – you can install of kinds of IM clients on either device – Viber, Whatsapp, Skype, you name it. The thing with iMessage is that it is seamlessly integrated in your messaging app, so sending messages through it doesn’t require you to do anything different from what you would do to send a regular SMS. It’s a nice way of saving you some charges when you are texting your iOS-rocking buddies and that’s why we believe it’s actually a good thing to have. Is it just me or is GSMArena Becoming a Samsung Fanboy? Example: how does one Tie in Battery Life when iPhone 5 beats the GS3? Given that the Apple iPhone 5 scored an endurance rating of 51 hours and the Galaxy S III got 50 hours, we couldn’t see this chapter ending in anything but a tie. The 1 hour difference means that if you use the two smartphones as in our testing procedure (an hour of calls, an hour of web browsing and an hour of video playback per day) you’d have just under 2% battery left in you iPhone by the time the Galaxy S III dies. Not exactly a huge difference, is it? Furthermore, some iPhone users aren’t exactly getting to experience the same kind of longevity we did with our test unit (including Chavis from our team). I think you guys are biased towards the iPhone on some of those. So… the SGS3 has a micro USB… But the iPhone has a fancy suite that you have to install to download pictures from the camera folder via a cable that costs 30$ so it’s a tie! Wuut?! No, it’s a tie in the picture browsing department, because the two can import images from all kinds of memory cards with an optional accessory. 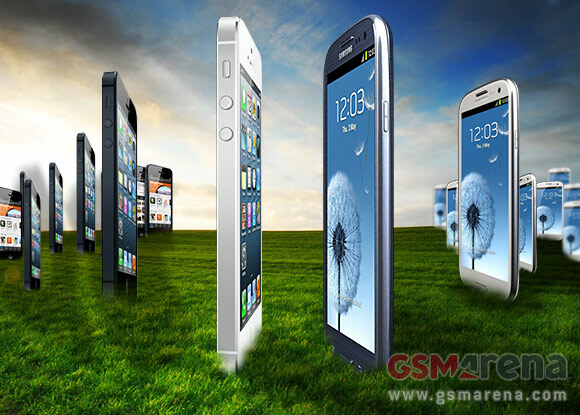 Also the iPhone 5 has more accurate color reproduction, while the Galaxy S III makes everything livelier. It’s true that the iPhone 5 camera connection kit costs a fortune, but the official Samsung USB host adapter is hardly going for pennies either. GSMarena, I’ve been your loyal review reader even before the trend of touchscreen hitting everyone of us. but to be frank, this is by far your WORST review ever. perhaps its because you will not like to hurt the feelings of iPhone naive users, or even afraid the Apple company will not give you anymore products to review in the future by reviewing the TRUTH. only brainless and blind-worshipers of Apple will really think that their god-like Apple thingy is better than S3, or any other flagships (Optimus G, Lumia, One X etc.) as a longtime reader, I felt extremely bad about this one-sided, biased review. But of course it is. Now excuse me as I take my Bentley (that Apple paid for) out for a drive.